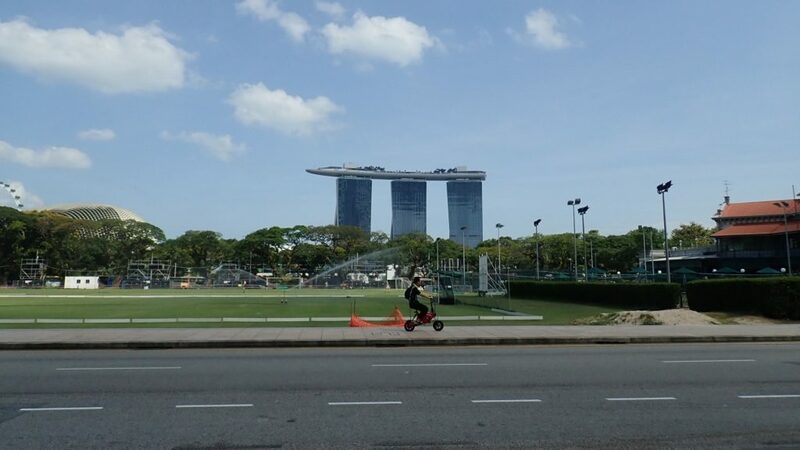 Singapore: the furthest tip of Eurasia, where the world’s largest landmass gives way to Indonesian islands and you have to get your feet wet for the first time since Norway. It held a near-magical lure for me: when I’d found out that the borders of Burma were open and I could now ride through that country from Thailand to India, I’d decided to continue with my former plan, riding south and flying to Chennai. I’d told anyone who asked that I was already too far south to turn back, bit that wasn’t the real reason: I had my heart set on Singapore. To get there I’d go through Malaysia, a country so far away that I had little idea about the country, no concept to hang it on. All I knew was that it was really, really far away, that Anne Mustoe like it, and that most of my bike had been made there. I said goodbye to Thailand at a border crossing in the mountains, in the middle of the jungle. This wasn’t to be another third world epic of suspicious bureaucracy though: the guard barely glanced at my passport before waving me through. This was to be the tone of Malaysia throughout my whole time the: it was safe and it was easy. 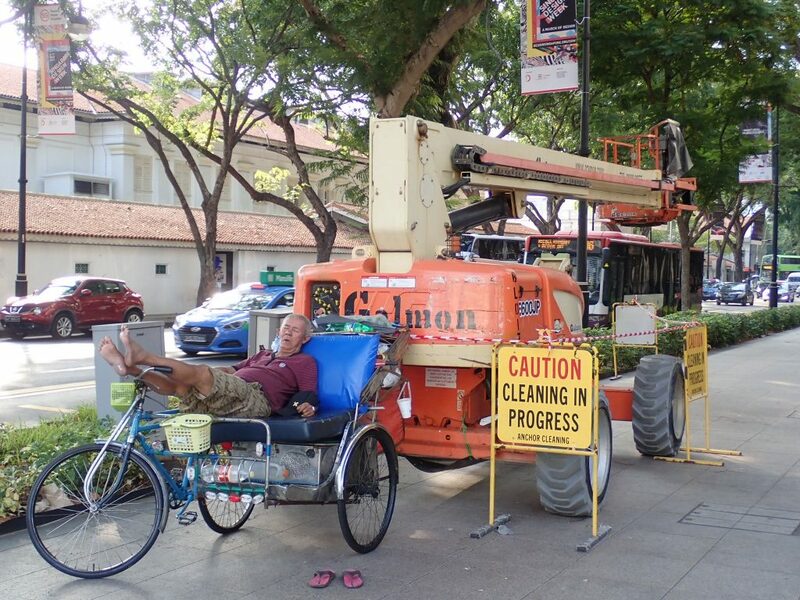 It was easy to get a SIM, it was easy to get cash, easy I find somewhere to sleep, easy full stop. 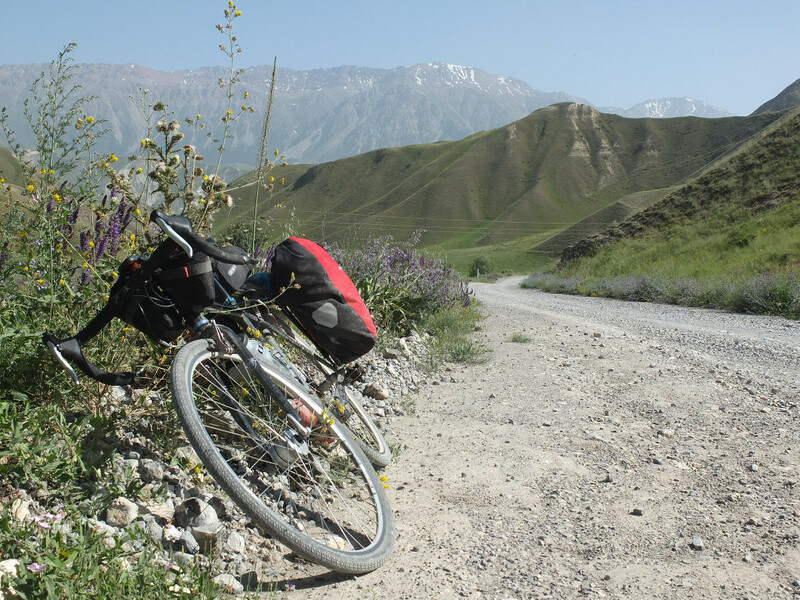 I was out of the poor countries now, into places with money, and could expect good roads, roadside stops, shops that sticks what I needed, cafes txt didn’t make me ill … everything I could want. Malaysia was also a little bit British. In its previous guise as Malaya it was the last of the British colonies to make money, and now as an independent country it still had towns with names like ‘Georgetown’, shops like Costa Coffee and a generous smattering of colonial architecture, plus excellent spoken English almost everywhere. After spending so long in the cultural side of China, it verged on the disconcerting. The ferry to Georgetown on Penang Island, Malaysia. 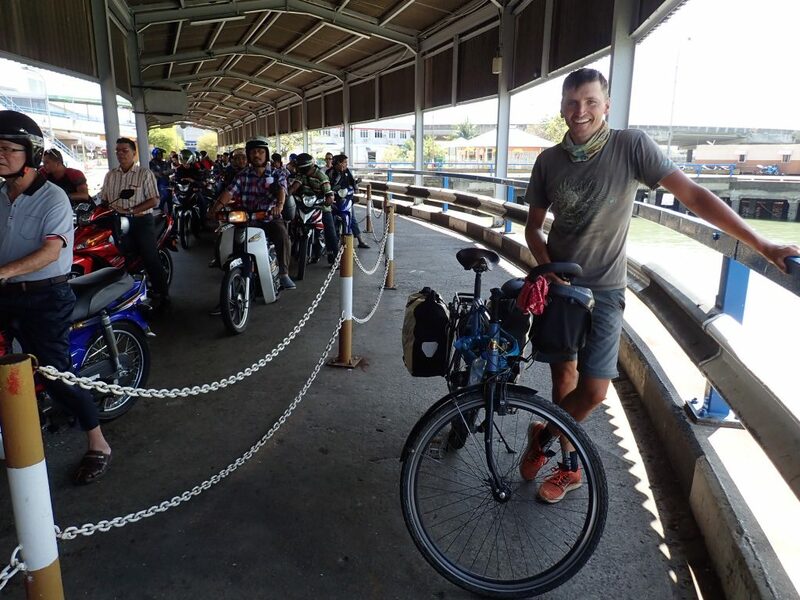 The cyclist of Christoph, a German I met at the Thai border. 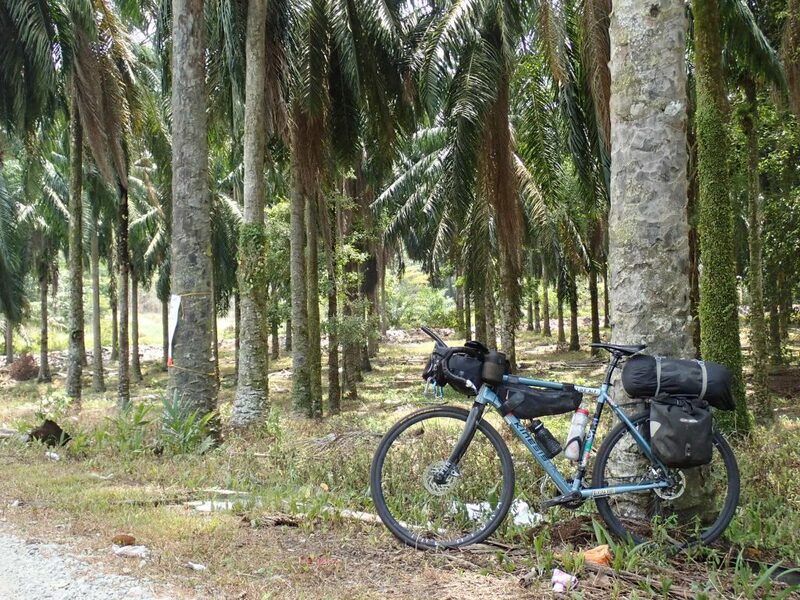 The actual riding in Malaysia was mostly spent going through palm oil plantations. These form an astounding ten percent of global cropland – almost all of it in Malaysia and Indonesia. Palm oil goes in virtually everything these days and the industry is a major part of Malaysia’s economy but the deforestation has been massive; for hundreds of miles I saw little except near-continuous palm plantations, former rainforests that were now monocultures. 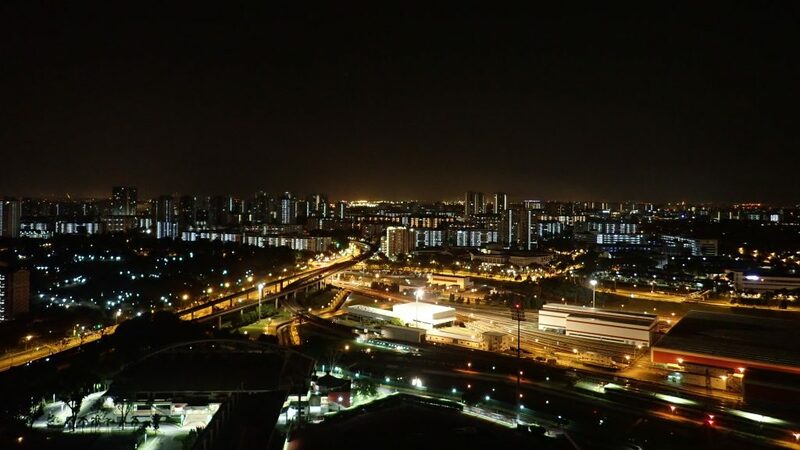 And so to Singapore, the tiny island state that loomed large in the regional economy, a pivot for global trade, the metropolis at the end of the world. Having reached here, it was time for a break. My hosts lived halfway up one of the many skyscrapers and I could rest, read and write on the balcony as I watched the city twinkle. This was where I departed from my original routee. For the last eight months I’d followed the plan is made in England – more or less- bit now was time to branch out, leave the plans and the Pacific Ocean behind and strike out into the heart of Eurasia. South East Asia had mostly been easy; from hereon it would be hard. India and the steppes of Central Asia beckoned. It was time to go. Singapore. Yes, it’s a building with a boat on top.